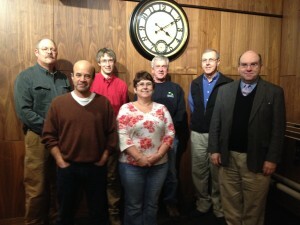 Committee reps from Shelburne, Gill, Erving, Ashfield, Whately, Heath and Conway at a recent meeting. The FCCIP provides building inspection, plumbing and gas inspection, wiring inspection and zoning enforcement for fifteen towns in Franklin County. The program receives guidance on budget, policies, and fee schedules from an Advisory Committee appointed by member town Selectboards. The Advisory Committee is made up of representatives from all member communities, and meets quarterly. Review, debate, and endorse an annual proposed budget before it goes to the full FRCOG Council for approval. Bring concerns from member communities to the FCCIP and FRCOG staff. Meet at least two times per year with town Select Board to update them on FCCIP budget and programming, and bring any resulting questions or concerns back to the staff. Review and approve any changes in fees for the three programs. The Committee is currently chaired by Brian DeVriese of the Heath Selectboard. Click here for a FCCIP Advisory Committee Membership for 2016. Click here for a copy of the Advisory Committee’s Operating Procedures: FCCIP ADV COMM op_proc.2014.